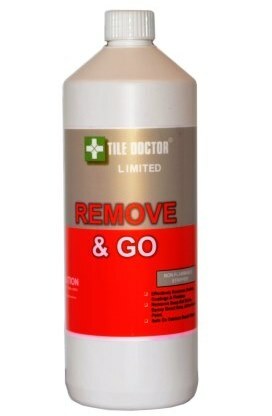 Tile Doctor Remove and Go is a non-flammable, multi-purpose stripper formulated with a long dwell-time to remove most sealers, epoxy grout haze, urethane coatings, synthetic finishes, adhesives and paints. 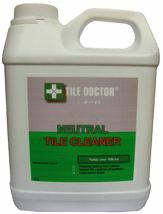 This product also draws out ingrained stains and removes heavy grease build-up. 2.) SHAKE WELL before using. 5.) 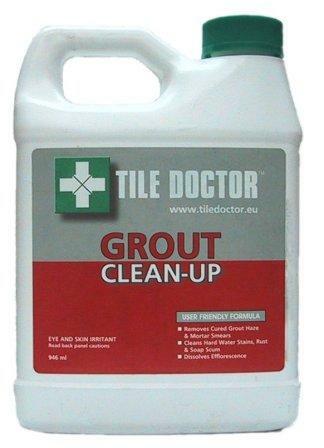 Apply a small amount of remover to a small area of up to 2m² (25 sq. ft.), spread with a sponge or scrub brush and allow to stand for 1 hour without drying or until coating or residue softens. Do not allow stripper to to dry on surface. 6.) Agitate with a scrub brush. A scrub machine may be used. 7.) Wipe up residue with a clean, absorbant white cotton towel or sponge. A wet-dry vac can be used. 9.) Wipe surface dry with clean, absorbant, white towel. 11.) For large commercial installations, a white pad may be used with a scrub machine. 12.) Removal of thick coatings or residue may need several applications. Approximately 2m² to 5m² (18 to 50 sq. ft.) per litre depending thickness of coating or amount of residue to be removed. Available in 1 litre bottles at £17.00 each. Postage & Packing £7.50 (Incl.VAT) for 1 item, £10 (Incl.VAT) for two or more items. Also available in 5 litre bottles at £69.00 each. Postage & Packing £10.00 (Incl.VAT) for 1 or more items. ♦ Close container after each use. ♦ Store and use out of direct sunlight and in temeratures above 10°C (55°F) and 27°C (80°F). ♦ In case of spillage, absorb with sawdust, sand or cat litter. ♦ Unused, stored product is freeze-thaw stable. ♦ Use in well ventilated areas only. ♦ Avoid prolonged breathing of vapour and contact with eyes. ♦ Protect hands with household gloves and eyes with saftey glasses. IF INGESTED: Do not induce vomiting. Drink 1 to 2 glasses of water, seek immediate medical attention. INHALATION: Relocate to fresh air. If symtoms persist seek medical attention. EYE CONTACT: Flush with large amounts of water. If irritation persists seek medical attention. SKIN CONTACT: Wash skin with soap and water. If irritation persists seek medical attention.